Chessdom: Please tell us about your recent trip to Asia. 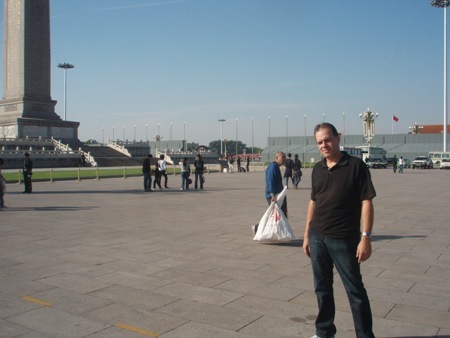 Efstratios Grivas: Well, I have been in Asian Continent since October 2nd and I will be back home on November 1st! That means that I will spend totally one month in this lovely but rather new for me earth-place. When I started my travel from Athens, my first stop was Istanbul where I joined the Turkish Delegation (over the last 2,5 years I am training and captaining the Turkish National Men Team) and we flew to Beijing in China for the 1st World Mind Sports Games Festival. We participated in all events scoring some nice results, at the same time enjoying the capital of the 1,3 billion state. Then, on October 20th I flew to Vung Tau City in Vietnam where I have been the main lecturer of the FIDE Trainers’ Seminar, coaching at the same time a squad of Turkish Junior Players. I am expecting to fly to Doha in Qatar on October 31st where I will also have the chance to visit this country for one day as the next day finally I will be able to fly back home. A rather long trip but I can only be satisfied as I had the chance to see and enjoy some quite nice places and meet interesting people. Chessdom: How are you enjoying your time in Asia? Efstratios Grivas: Asian culture is rather different from mine as a European citizen. Asian people are quite gentle and in general nice and the Asian countries’ ancient history allowed me to acknowledge and admire different and ‘mysterious’ civilizations. On the same time I must admit that I have enjoyed a lot as I was able to participate as coach, trainer and lecturer in two respectable events – the 1st World Mind Sports Game Festival and the World Youth Chess Championships. Chessdom: What is your opinion on the chess development in that region? Efstratios Grivas: You can easily understand that there is a chess explosion in the Asian countries over the last 10 years. Led by China, which at the time of being can be considered one of the three strongest in the world, the Asian players are seriously showing their teeth to a lot of traditionally strong countries. People in general are quite fond of our sport, willing to get better and better and benefit from it. Also, we can see a lot of continuously successful events all around the continent. Chess has been backed up and it will pay dividend by helping its followers. Chessdom: Tell us more about the training seminars that you conducted. 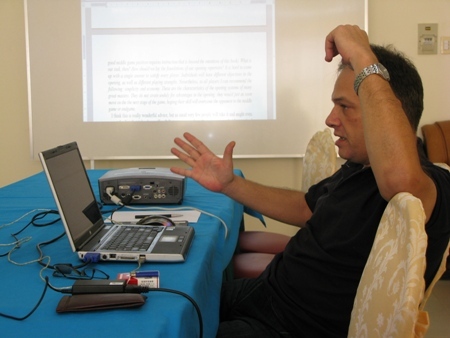 Efstratios Grivas: Well, I have been the main lecturer (the other two were IM/ST Jovan Petronic and FM/ST Ignatius Leong) at the FIDE Trainers’ Seminar that was conducted during the WYCC in Vung Tau City in Vietnam. For 8 days and a total of 35 hours, we tried to teach a certain approach to modern chess training to our ‘students’. I have the feeling that we succeeded and I am sure that also our students will be able to succeed in their chosen profession. The FIDE Trainers’ Committee is trying to develop a training system based on serious training seminars and certification processes, which in the end will allow everybody to make the correct choice for their chess education no matter of the playing strength. But I feel that we have a long way to go before we establish perfect procedures. Special thanks must be given to our seminar coordinator FM/ST Peter Long for his efforts. Chessdom: What has changed in training methods over the last several years? Are there any new techniques in sight? Efstratios Grivas: There is a need that all trainees, regardless of race, creed or circumstance, to achieve their full potential. Our task as FIDE Trainers’ Committee is to make it possible. Our mission is to provide practical, step by step assistance. Our aim is not only to teach what a trainer must know in order to perform well in his profession, but also to show the correct way to teach his/her knowledge. The trainers’ intellectual conversations very often come to the conclusion that chess has changed to a clear science, and demands from the top chess-player to watch for every-day information. But, very often you just have to perform the basics and then the rest are coming. Nowadays, this saying has become a motto of the top trainers that have worked or are working on a high level. We can be assured that today’s proper chess training is based on an academic form which combines the traditional techniques (the basics), the computer help and the scientific preparation. Chessdom: What is your opinion about the perspectives of the coaches attending the seminar? Efstratios Grivas: If their goal was to get a FIDE certification they succeeded. If their goal was to learn they succeeded. If their goal is to properly teach they will succeed. Chessdom: What are your plans till the end of the year? Efstratios Grivas: Still there is a lot of work to do. On November 12th I have to fly to Dresden where I will be captaining and coaching the Turkish National Men Team at the Chess Olympiad. In December I will have to attend my monthly camp in Ankara and in-between I will train some Greek juniors and clubs as usual. Finally, I have to prepare some surveys, mainly for ChessBase Magazine and New in Chess Yearbook. Well, do not think that I am complaining – I managed to turn my hobby into a profession and I really feel happy about that. And by the way, I hope that I will find enough time to spend with my wife and my two lovely kids!